An eagle-eyed Do Not Knock campaign supporter recently spotted this innovative approach to dealing with unwanted door to door sales in the United Kingdom. 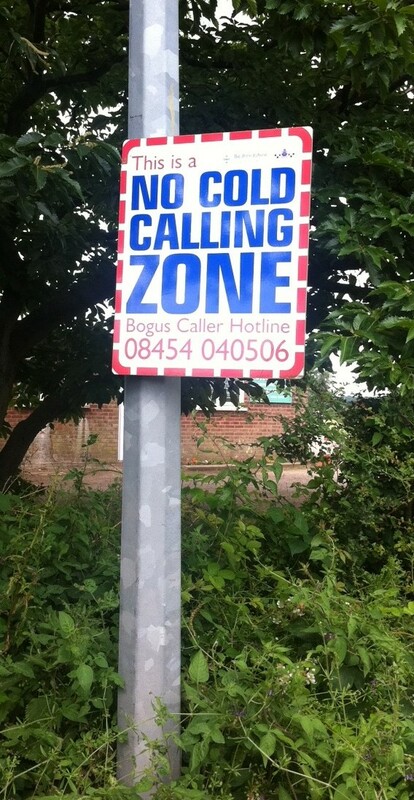 The county of Bedfordshire is one of a handful that have introduced ‘no cold calling zones’. Zones are set up by Trading Standards bodies working, with local Police and local or district councils. Zones are established by erecting prominent street signs like the one pictured here, that indicate that unsolicited door-to-door sales are banned. 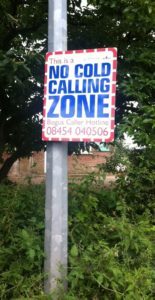 The street signs also include a ‘bogus caller hotline’ which residents can call to report salespeople breaking the rules. It’s great to see local communities working together to stamp out unwanted sales approaches, and there’s no reason a similar system in parts of Australia with local council involvement. We’ll certainly be keeping our eyes open for the chance to trial such a program here.